Here’s what you’ve all been waiting for this week (except maybe Rich! )—the attempt to find the rest of the abandoned Eagles Crag Footpath, thus completing the loop with the Potholes Trail and giving us many more options for people-free routes on Cadillac, from which we can tailor our hikes to our moods and abilities on any given day, and of course learn more about the history of trails and trailbuilding on the island! 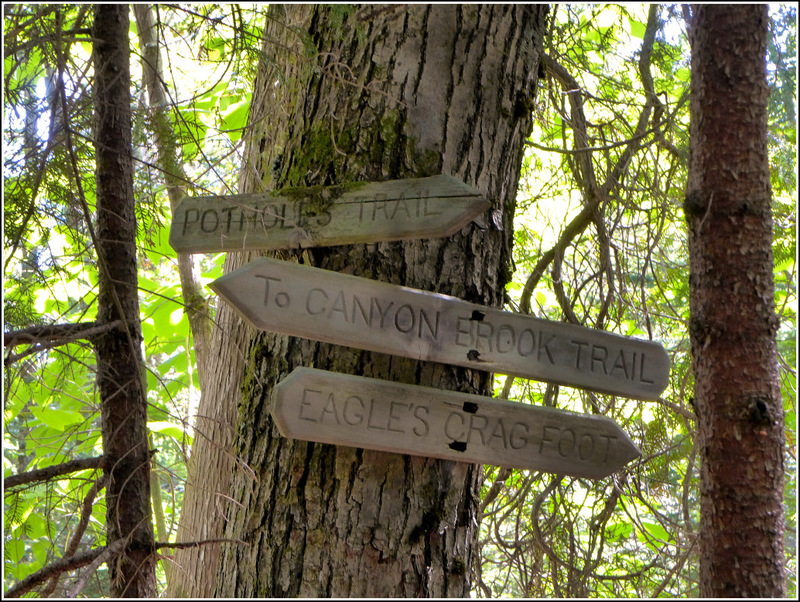 Two years ago, on the day we completed the Potholes Trail, we had hiked “just part” of the Eagles Crag Footpath, mainly to satisfy some of our curiosity about how far it was marked and what condition it was in. 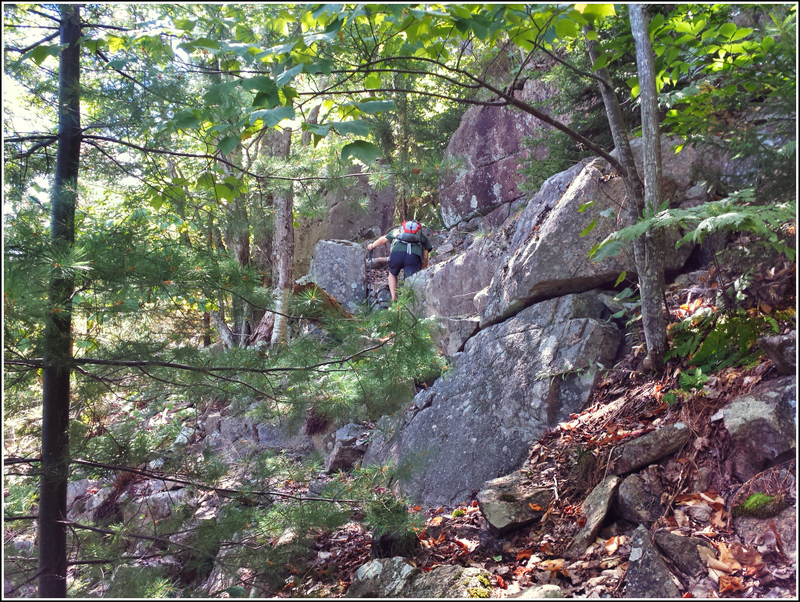 Turns out that it was in excellent condition and well marked with cairns, and we went farther that day than we had thought—about halfway up the side of Cadillac, based on pure straight-line distance, as far as we could tell by our GPS tracklog. This morning, Rich and I decided that it would be a good idea to shorten our initial plan (which was to start at Sieur de Monts) to a route that begins at the Dorr Mountain parking pulloff, heads up Canon Brook and then follows what we call the Dorr Mountain South Ridge extension—another abandoned trail that we’ve hiked several times before—to its intersection with the eastern end of the Potholes Trail. 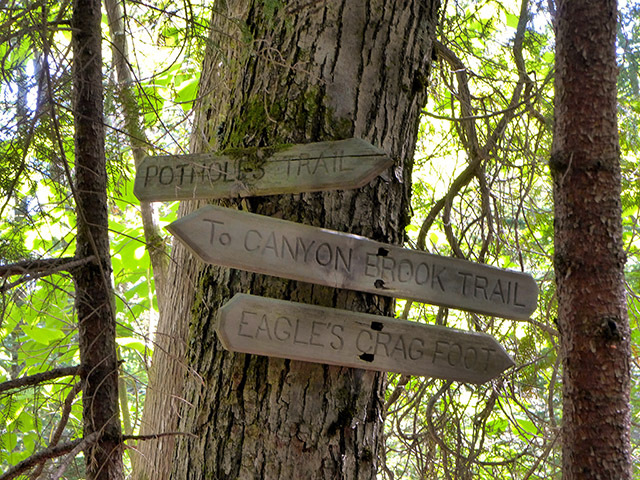 This is where the old trail signs can still be found, nailed to the trunk of large tree. They’re so cool! Then we would proceed straight ahead to the Eagles Crag footpath. Rather than drive to the Dorr Mountain pulloff and hope to find a parking spot, we took the Island Explorer bus from the Village Green. The Sand Beach bus passes the pulloff, but only on the return portion of its route, so we would have to ride the entire route around part of the park loop road, through Otter Creek and to Blackwoods Campground first. That was fine, though. It’s a pretty quick trip and it was a gorgeous day, so we had plenty of beautiful scenery to enjoy. 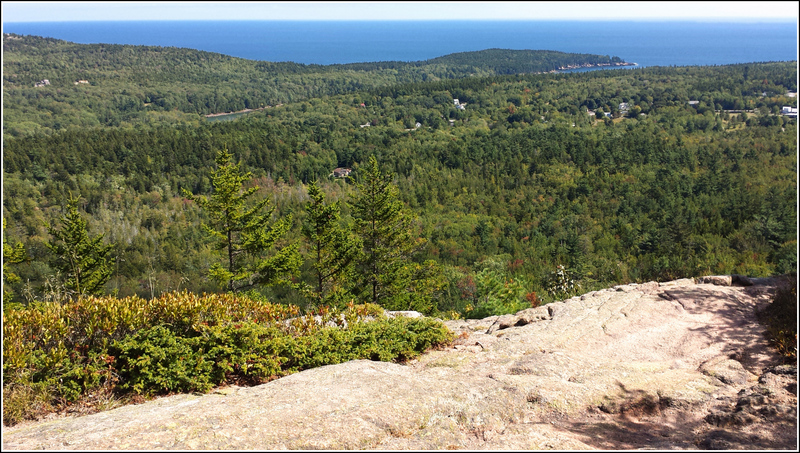 Plus it was Acadia’s car-free day on the loop road, so vehicle traffic was considerably lighter than usual. We figured the driver was wondering why we went all the way to Blackwoods and were still on the bus but he understood when we explained where we wanted to get off. We went back through Otter Creek and let him know when the trailhead was approaching. There’s a nice pulloff on the right side of the road too, so he just pulled in there and let us off. The first part of our hike was on an official trail: the lower half of Canon Brook. It’s an easy walk in from Route 3 that involves a few bogwalks and then a left turn onto the trail proper. The trail undulates in nice clean whoop-de-doos that we both thought would be perfect for mountain biking, were bikes allowed on any of the trails in Acadia. 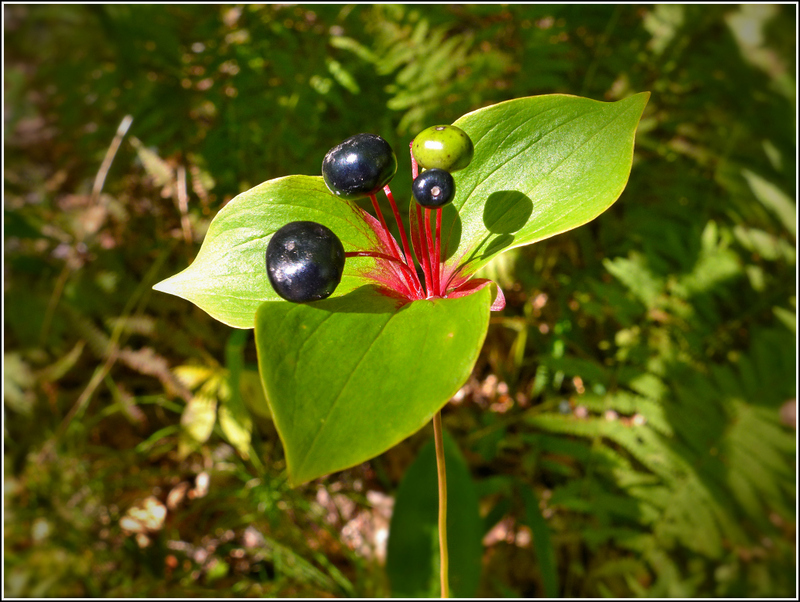 Near the wetlands at the beginning of our hike we saw some interesting plants, including these that look similar to bunchberry or trillium leaves but with protruding blue-black berries. We later learned that they’re called Indian Cucumber (Medeola virginiana), due to the supposedly cucumber-like flavor of their rhizomes. (We haven’t tried it.) The attractive berries aren’t edible. Several groups of hikers passed us on this portion of the trail, but they would be the only other people we’d see until the end of our climb up the crag. We turned onto the Dorr South Ridge extension path and like a breath of fresh air, here was our familiar abandoned peaceful beautiful trail laid out before us. Aside from some blowdowns like we’ve seen in many areas this year (maybe there were bad storms over the winter?) the trail is still in perfect condition and it’s obviously used occasionally and maintained by locals. Cairns still indicate the path in the few areas where it gets tricky, although it is quite easy to discern over almost all of its length. The stream crossing can be a little confusing as can one other area where the trail curves through open woods, but otherwise it’s quite straight. We had the added advantage of having many (at least 69) waypoints taken on previous expeditions, should we doubt our trailfinding skills this time through. The water was low enough that the crossing of Otter Creek was easy. We noted the huge beaver lodge damming up the creek—no idea if it’s still in use. Then after some more easy hiking we came to the signs on the tree! Time to begin the climb to Eagles Crag. The trail is quite clear and very well marked with cairns, just like on our last visit. It passes through open woods and over some ledgy areas before entering deep woods, where it begins climbing steeply. It was here that we both noted the extreme contrast between this trail and Potholes, which is on the same (east) face of Cadillac not very far away, and yet vastly different in atmosphere and terrain. On the Eagles Crag footpath we climbed up and up, still in deep woods. We eventually encountered a talus slope with tricky footing, but which was still very well marked with cairns all the way so we never felt at a loss for where to go next, even if we had to take great care with each step. At one point we noticed an obviously constructed walkway, somewhat fallen into disrepair but still very usable, crossing a slope horizontally, and later an obvious stone staircase set into the steepest part of the climb, again a bit weather- and time-worn but still a sign of painstaking trailbuilding. Beautiful! I looked ahead and saw some ropes angled out from the crag. Hmm, we both thought we’d been hearing voices for the last hundred feet or so. This is why. They were a young man and a young woman. I think they were as surprised to see us approaching from the direction in which we’d come as we were to see them. 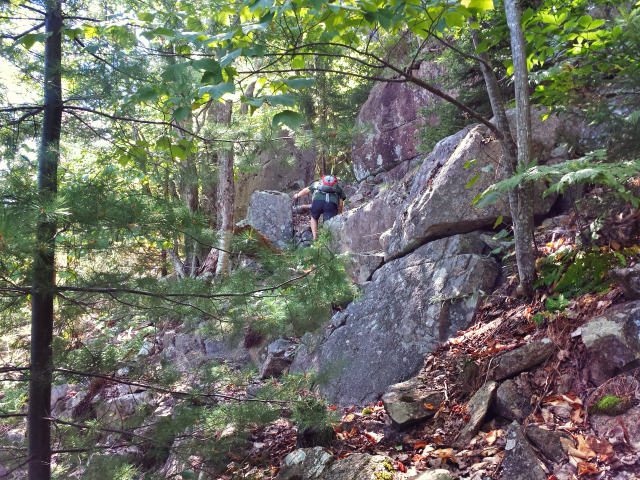 Rich mentioned our interest in abandoned trails, and that we’d come up from the Dorr Mountain parking area across the Dorr Mountain South Ridge extension, past the Potholes and finally up the Eagles Crag footpath. The woman worked for the park (she didn’t say if she was a ranger or what) but when we said how we’d love to see some of the old trails reopened she said dismissively “oh, we can’t maintain the trails we have.” We’ve heard this before. She then made some kind of comment about people “trashing” the existing trails, which again is something we have never seen and I honestly don’t know what she could be referring to. She mentioned the Ridge Runners removing “false” cairns which we think extends to cairns along abandoned trails. I think this is wrong. We can see removing cairns from intersections with existing trails or obscuring the intersections to avoid misdirecting the vast majority of people who want to stay on maintained trails. But if people want to hike an abandoned trail, and find it themselves, don’t remove the items that will help keep them on those trails, and keep them hiking safely until the end! It wasn’t an unpleasant encounter, but we had more to say and wish we’d had a better opportunity for dialogue. I think she was getting a climbing lesson, so I didn’t want to take up any more of their time and we continued on. 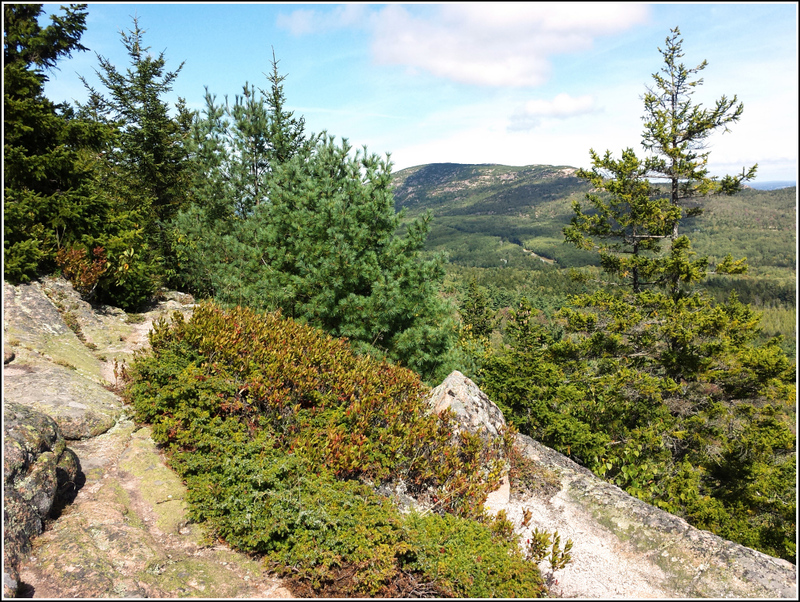 In a few hundred feet, we were on top of the Eagles Crag formation and sitting on a boulder alongside the current Eagles Crag trail, which is simply a loop off the South Ridge trail. The Eagles Crag footpath comes out very close to the South Ridge trail, so to make a slightly longer hike (and because I’ve never done the Eagles Crag loop) we took the long way around, and then completed the hike with the gentle descent down the mile-long (from this point) South Ridge trail. From Eagles Crag, the South Ridge is wooded along its entire length, and much of the treadway is an incredibly smooth slab of granite that provides easy and sure footing. Red squirrels eating nuts were everywhere! And far too quickly, we found ourselves at the trailhead along Route 3. We caught a bus almost immediately at the entrance to Blackwoods campground. And that’s pretty much what happened. We had the same hostess and procured the same quiet table. (The server was different.) We ordered some different beers—a Hefeweizen and an APA to start. Then we got crabcakes, which as expected in a seaside town were 90% crab, plus some chopped colorful bell peppers. They were cooked perfectly crisp on two sides and served with a pleasantly lemony aioli and some very interesting and tasty greens (“These look like weeds!” “Maybe they’re from the garden outside.”) Then our main meals came out. Rich had ordered the burger his usual way: with cheese and a thick slice of onion. No one, anywhere, seems to know what a thick slice of onion is! We got two thin rings, not a full slice. He mentioned it to the waiter (“oh watch, now we’ll get a whole plate of them” [which wasn’t far from the truth].) The waiter did mention that the onions are usually cut and separated ahead of time for use in various dishes, which I guess makes sense. I got the petite (half-size) burger which comes with a small salad—the McKay’s salad again, like last night. And tonight, they actually had the blueberry pie! I guess they dealt with the problem with Morning Glory and the pie arrived on time today. It was served with a rich vanilla ice cream from MDI Ice Cream. Everything was delicious and we left full and very satisfied but not stuffed. Maybe it was the beer (or those damned burgers!) but we were inspired to go on a covert mission to Agamont Park to restore the moose decal to the utility box. At some point over the last year, someone removed all the decals, including our moose, that we watched over Geddy’s webcam during the winter.